Whether performed in a dental office or using a home kit, teeth whitening applications are quite effective for bleaching exterior (extrinsic) stains on enamel surfaces. But what if your discoloration comes from inside the tooth? In this case, extrinsic teeth whitening won’t work — you’ll need to undergo an “internal bleaching” method, which can only be performed in a dentist's office. There are a number of causes for “intrinsic” staining, including too much fluoride exposure or tetracycline use during childhood. One of the more common causes, though, occurs from root canal treatments used to remove the remnants of the pulp tissue inside a tooth’s pulp chamber and root canals. Certain cements used during the procedure to help seal in the filling material and leftover blood pigments can cause the tooth to darken over time. To alleviate this discoloration, we use a bleaching agent, usually sodium perborate mixed with a diluted solution of hydrogen peroxide to achieve a safe, accelerated color change. 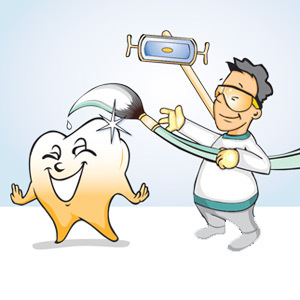 After determining that the root canal filling is still intact and the bone is healthy, we create a small cavity in the back of the tooth to access the pulp chamber. The chamber is cleaned of any debris or stained material and then thoroughly irrigated. The original root canal filling is then sealed off to prevent leakage from the bleaching agent. We then place the bleaching agent in the cleaned-out space with a cotton pellet and seal it in with a temporary adhesive. This step is repeated for several days until we achieve the desired shade of white. Once that occurs we then seal the dentin with a more permanent filling and then restore the cavity we created with a composite resin bonded to the enamel and dentin. If we’re successful in achieving the desired color, intrinsic whitening could help you avoid more costly options like veneers or crowns for an otherwise healthy and attractive tooth. The end result would be the same — a beautiful smile without those unsightly stains.